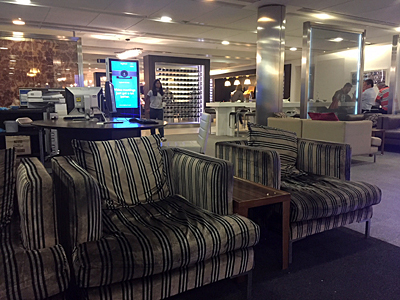 This is our review of the British Airways Galleries Club South lounge at London Heathrow Terminal 5. Regular readers may remember that we called upon a friend of ours called Jamie earlier in the year when we needed someone to travel to New York for a Virgin Atlantic flight review. The feedback in our comments about his writing style was positive, so when he offered to write a series on a recent trip to Indonesia we were happy to accept. His trip was exclusively in Business Class using airlines in the oneworld alliance, with all of the flights booked using Avios. We were especially keen to get some Malaysia Airlines coverage as we have always neglected it a little despite its oneworld status. 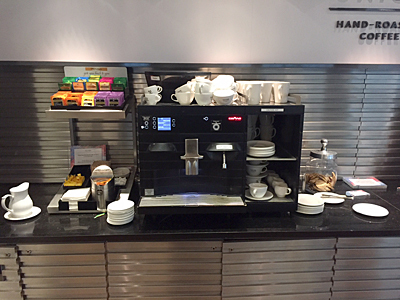 The first review is the British Airways Galleries Club South lounge at Heathrow Terminal 5. 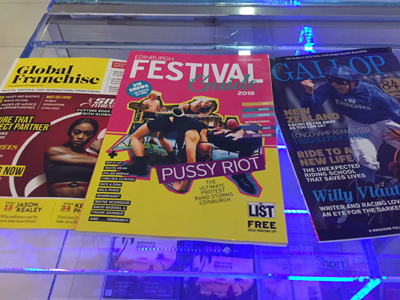 With the British Airways Galleries at Terminal 5 being the most visited lounges by HFP staff (and readers) you would think that there we’d have written a review of the South lounge already. But, for some reason, no one ever did – I think we thought all our readers had already seen it too. That’s obviously not the case, however, and we were happy to let Jamie take a look on your behalf and add it to our list of UK Airport Lounge Reviews. Over to you …. “I was embarking on a one month trip to Indonesia and, as it was a long haul journey, I decided to use some (most!) of my Avios to book my flights in business class. It had been several years since I visited the Galleries Club South Lounge. I don’t fly enough to earn British Airways status but I did make numerous visits whilst holding Cathay Pacific Gold Status a few years back. I was curious to see if this lounge had changed at all in the intervening years. Once through security, it took no more than five minutes to get to the South Lounge, passing through the main shopping concourse on the ground floor and then heading back up several floors past the Concorde Room (First Class ticketed passengers only) and Galleries First (Gold card holders) to the entrance. You will know you have arrived when you see the horse lamp – yours for $5,649! 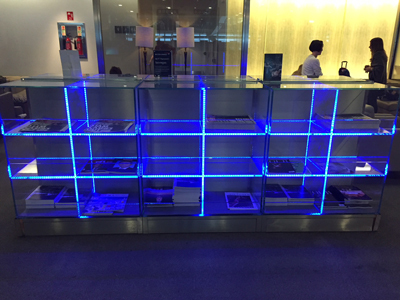 There are three Galleries Club lounges in Terminal 5 for Club World, Club Europe, BAEC Silver members and oneworld equivalents. Galleries Club North is the one you are more likely to visit if you arrive at Heathrow by tube or Heathrow Express. It is next to North Security opposite the lifts from the trains. 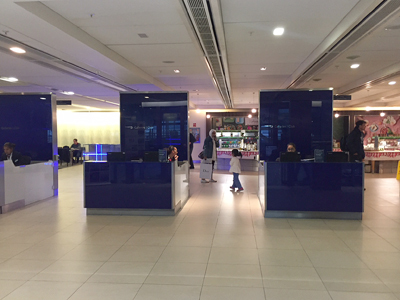 There is also a Galleries lounge in Terminal 5B, the first of the two satellite terminals. This is by far the quietest of the three and, if your gate is showing as B or C when you arrive at the airport, you are best to head there if you want to avoid the crowds. Back at Galleries Club South, there was no queuing and I was ushered in with a smile. I was also told to allow 20 minutes to get to my departure gate. The pictures below are a little dark, unfortunately, but so is the lounge …. As lounges go, Galleries Club South feels quite large but in reality it’s actually not that huge. There’s something about the design when you walk in that can make you feel a little overwhelmed and disorientated. Rob told me that he prefers Galleries North for the same reason – there is something about the layout of Galleries South makes him feel uncomfortable. The lounge is designed in a kind of a T shape. If you turn left after the entrance desks (into the head of the ‘T’), you are faced with an open seating area to either sides with windows along the full length of the wall in front of you. These provide an outside view of the airport. The natural light here makes this side brighter during the daytime. If you turn right you are faced with a long run of seating. This side has windows down at the end of the hall with charming views overlooking the security check point and departures area. As such it always feels darker and less open but more private. Without fail, I have always chosen to head this way and find a seat. There are a few departure information screens scattered throughout the lounge but you are unlikely to have one close to where you are sat unless you actively make that choice. There is a good size business centre on this side of the lounge with maybe seven or eight work stations and a photocopier/fax. Wifi is good quality and WhatsApp calls worked perfectly. Both sides of the lounge have separate bars and tea/coffee stations which are self service. Beers included Heineken, Tiger, Amstel Light and Tribute Cornish Pale Ale. There was a good range of spirits available so. All the wine selections are located centrally with the food offerings, which we will come to later. 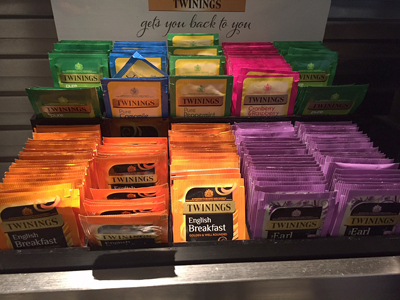 I can’t vouch for the quality of the coffee as I don’t drink it but there was a decent selection of Twinings teas on offer. Two types of biscuits were available, too. I can vouch for these (from many occasions) and say they are very tasty, although it is slightly odd that they have never been changed in all these years! Hot and cold self service buffet food is located in one central area close to the entrance desks (you can see it in the photo of the entrance desks, behind them). 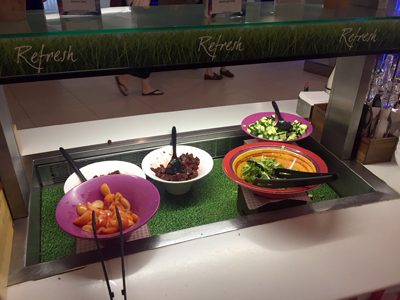 There is a fairly uninspiring salad bar. And a rather sad looking cheese selection with Carr’s water biscuits and oatcakes. There were two varieties of soup on offer – organic tomato & basil and leek & potato. These were accompanied by a selection of mini bread rolls. I tend to have a bowl of soup whenever it’s there and always find it to be tasty. 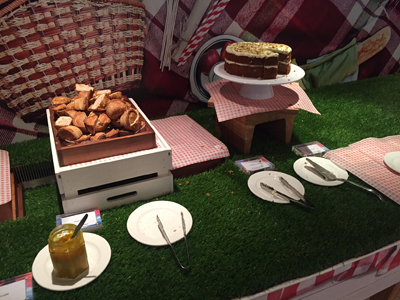 Next to the soups was a large dish of pork pie slices and a carrot cake…! One of my overriding memories of food in this lounge from my days as a Cathay Pacific Gold cardholder is the small jacket potatoes and chilli con carne that seemed to be served every time I visited. On this occasion they were nowhere to be seen. 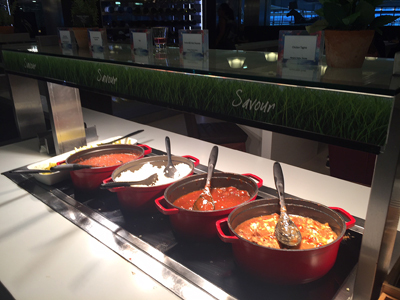 Instead the hot food choices included chicken tagine, Cuban black bean cassoulet and BBQ beef meatballs, accompanied by rice or penne pasta. I had the meatballs and they were fine, but don’t expect a gourmet experience here. The carrot cake and a Twinings green tea afterwards were rather more enjoyable. Apples and oranges are also available. Hot food is only served between 12-3pm and 6-10.30pm. I’ve never been in here in the morning but breakfast is served from 5am. 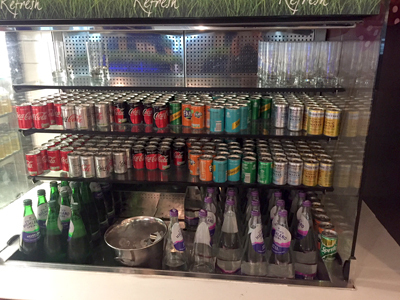 There is a wide range of soft drinks to enjoy including the usual suspects of Coke, Fanta, lemonade, still and sparkling water. There is also ginger ale and two types of Fever Tree tonic water, all of which go well with gin. Four juices were available too. 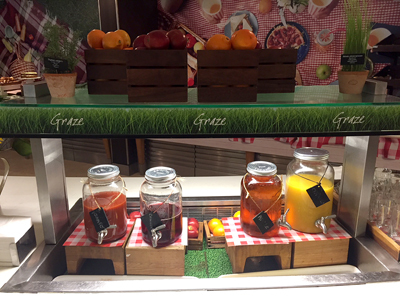 When I arrived I noticed that the apple juice was empty but was swiftly refilled. The wine selection is located in a simple modern designed display, close to the hot food. There was a choice of four or five red and white wines. The red wine choices included 2010 Chateau Faugeres Saint-Emilion Grand Cru, Wakefield Jaraman Shiraz 2015 and a 2016 Bodegas Santalba Rioja. I admit I didn’t take a look at the white wine as I got distracted by the two baskets of kettle chips above them. I didn’t see any champagne and always assumed it is not available. However, I recently read its available on request if you flag down a server. I have been missing out all these years! I don’t remember the magazine rack looking quite so funky and bright so maybe some changes have been made since my last visit. I also don’t remember there being such a terrible selection of magazines. Global Franchise or Gallop anyone? The guide to the Edinburgh festival may have been useful, except that it had finished several weeks before. I picked up a copy of the latest Shortlist, good light filler reading but not exactly enough to keep me going to Kuala Lumpur. As I was sitting down, looking around the lounge, I realised nothing had improved in the last couple of years. I thought the whole lounge felt a little tired. Perhaps I’ve used it too many times and the novelty has worn off. There was certainly none of the excitement I felt the first few times I visited. As on some previous visits, there was an underlying messiness to the place. The state of the food buffet areas wasn’t great and there were plates and glasses scattered around on many tables. There were several staff visible around, all working hard to keep the lounge clean it seemed. However it was obvious they were not staffed to cope with the high numbers of guests passing through. If you’re hoping to get a good meal in here before jumping on a night flight then think again. But if you want somewhere to kill time relaxing, whilst enjoying a small bite and a good glass of wine then you won’t be disappointed. Just don’t expect VIP treatment. Do all the three BA business lounges at T5 stock the same chambers or is one better than the others? 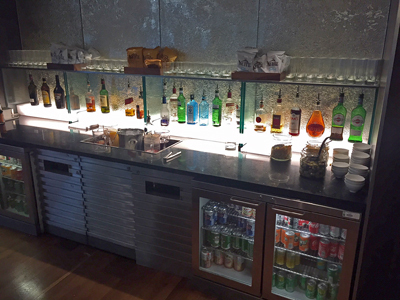 Personally I found the alcohol selection in BA;s T3 lounge to be quite OK. But it’s a while since I’ve been in there. 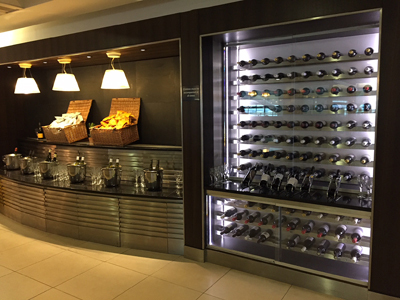 It always look good – the wine display in the First lounge in Terminal 3 is very impressive. Not sure how it tastes, but …. Tried both lounges and still prefer the PP in T5. Chicken escalopes and spicy BBQ are great. I was in this lounge a few weeks back and I found it crowded, chaotic and the food was very average. The seat I managed to secure was so far from the food that I had to run the gauntlet of rampaging kids and oversized hands luggage to carry my food back to my seat. It’s still a better place to wait for a flight than the airport environment though so I came away satisfied. I’ve also used BA’s fairly new Gatwick Lounge which was better but still far from relaxing. Virgin’s lounges at Gatwick and Heathrow I thought were fantastic in comparison. A really enjoyable and relaxing environment that bettered the overall travel experience. I conclude from this that BA really are fighting a losing lounge battle. They have so many passengers to deal with that their business class lounges will always be busy and far from the relaxing haven that most people imagine a lounge to be. The only thing they could realistically do is create a massive lounge (like Emirates in Dubai) but that just makes it even harder to provide any kind of service. Without any understanding of the consequences, I don’t think they can create any sort of premium experience without separation of long and short haul flyers. The sheer numbers that have access make the lounge a crowded hectic place. The ME3 and Asian carriers are a mystery to me, but if you look at the US carriers there’s no longe access as a result of a domestic flight, there are odd exemptions for coast to coast, but broadly speaking lounges are for long haul international flyers. US Lounges are for those in premium long haul, anyone with one world status of sapphire and above ( unless via AA) and those who choose to pay for Admirals club access. The lounges in JFK and LAX that I have been in are crammed depending on the time of day but they remain a far better experience overall than galleries with the possible exception of the food and beverage. OT I was on a SAS flight from OSL > AMS this week and nice clean aircraft and a free coffee plus refills. Then from AMS > LHR T4 on KLM. A vegetarian wrap and what ever drink I wanted (alcohol or soft drink or hot drinks) Both services FOC as part of the service. BA could learn a thing or 2. Then nearly an hour to get from T4 > T2/3 > T5 to get my car. Should have got a taxi from T4 to the T5 parking. The biggest problem with BA is they no longer know who they’re competing with and once my silver status expires I’ll just go with whoever is the cheapest/most convenient option unless there’s a good Qatar sale coming up. My partner came over from Lisbon a week ago on TAP. Y class. Half the price of BA and free food and drink on board. After the calamity with BA having denied boarding to my partner and me in June (regular HFP readers know the story) we chose to ditch BA and bought tickets for TAP and what a contrast it was to good old Speedbird! Why did you go via T2/3 to get from T4 to T5? Is it because you’re one of those “I’m too good to ever step foot on a bus” people, even when it’s free and only takes 10 mins? For the record, buses are almost always the quickest way to transfer T4T5. Especially when the inter-terminal transfer is not currently running so the only train connection to T4 is the half-hourly stopping service from Paddington. Erm no. I prefer the bus in London to the tube. Didn’t realise there was a bus service outside to take you. Used the train as that’s all I knew. Also didn’t think I could use the internal bus as that was for flight connections. Was under the impression that I needed to clear customs. I struggle with the BA lounges because my husband and I are dairy intolerant – it makes us quite ill if we have any cream/cheese/milk products. Trying to find a soup without dairy for example is always difficult. 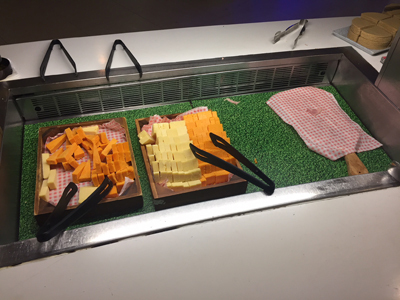 I’d rather eat in the lounges than the plane on a night flight but sometimes there’s nothing on offer. I think lounges and food intolerances don’t mix well. I’ve not been to one that caters especially well for them. Food intolerance is a bit of a myth, obviously Chinese people don’t like milk too much & get silly on one can of beer. For most people, you’re clutching at straws in the hope that your loose bowel movements are somehow not the result of your food choices. Ie you want to blame something else. Eat sensibly, nice balanced diet, & you won’t get loose bowel movements. Lots of meat, rice, bread, pasta. Keep off the fruit. That’ll sort you out in a day. Not sure what you’ve got against food intolerances harry! I recall you’ve made similar comments in previous threads. No doubt, there are some that claim intolerance when in fact they don’t, but these things are medically diagnosed – often to the extent that products are available on NHS prescription to Coeliacs and the like – and not just people eating poor diets or being fussy. And a big waste of NHS money it is, too. If somebody fondly (falsely) thinks they have a food intolerance, they should pay for their chosen diet on their own money, not get the taxpayer to subsidise it. Rice, bread and pasta is just high carb/sugar food. Food intolerance is very real. All dairy/ milk products make me very ill. Oh, and I assure you that neither I nor my relatives get silly on one can of beer! Lounges often barely do a good job for the majority never mind the minority. has anyone successfully booked flight with lloyds upgrade voucher for someone else? If so what strategy have you used. I believe you can only use the voucher on someone else if you are also travelling (ie 2 pax travelling the same itinerary, upgrade one leg for both pax). I had two vouchers and was able to persuade them to use the second voucher on a second booking (slightly different return flights) but that was only after a lengthy referral to a supervisor and only I think because I was making a booking for myself in the same phone call. I don’t think you can book for someone else if you’re not travelling. Yes, had to ring up and booked it on the phone. I wasn’t travelling on the same booking. Easy to do, just ring up and they will book it. We used this lounge before departing to Iceland over Easter this year. It was the worst experience of the trip. We booked Club as a birthday treat for my wife and thought being able to use the lounge would lead to a more peaceful and relaxing hour pre-boarding, grabbing a bite to eat and not worrying about where to sit before being called to the gate. It was a disaster – our party of 4 adults, two children and an 18 month old couldn’t find anywhere to sit together because all of the table were full of people eating with all of their bags piled onto adjacent chairs, people sleeping across sofas or just blocking areas off with bags to stop people sitting next to them. In the end we managed to squeeze onto the end of a table and must have made too much noise as our neighbours soon left leaving us more room. we were still short of two chairs which we were promised by two members of staff but unsurprisingly they disappeared never to be seen again. The tables were piled high with dirty dishes and cutlery, the food was running out within minutes of it being produced (I’ve never seen a fight over a bread roll before!) and the selection was awful. If I had known it was going to be this stressful and unfriendly I would have suggested we just go to a restaurant which I’m sure would have been much calmer! It was a complete contrast to our experience in the Saga lounge at Keflavik – family friendly, helpful staff, amazing food and a huge drink selection which after an almost dry week in Iceland was very welcome!! If it wasn’t for our excellent experience on board (staff and food were brilliant) I wouldn’t bother with Club Europe again, especially as two of our bags were lost for a week on our return. I did complain to BA but of course I have never received any reply. I’d have have woken up the sofa hogs &/or asked the others to shift up & move their bags. If shy, you could have asked the staff to do it. Spot on. Totally agree with you harry ! Why is it that far too many travellers think that they deserve 2 seats these days – either in lounges / on bus / on metro or even waiting at gate for boarding to start. Give them what they deserve – a polite and respectful verbal to shift their gear !!! One thing that the North lounge has over South, for me, is good views of the runway. The Gold Cathay Perk was fantastic for me. Matched to Air Berlin for 2 years, then matched to Alitalia until last year. Interesting review, leaves a few questions – there’s the North Lounge and the South Lounge in the main terminal, which one has the best chance of not being hopelessly overcrowded? And which way is North, left or right after security? Also if there’s another BA lounge out on one of the spurs to T5A or T5B or somewhere, is that a possible refuge? North is right next to where you come out after the fast track north security lane, right next to a pub before you go down the escalator. Was there Sunday morning and it wasn’t too busy once you moved away from the dining area and round to the left from the entrance where the booze is.